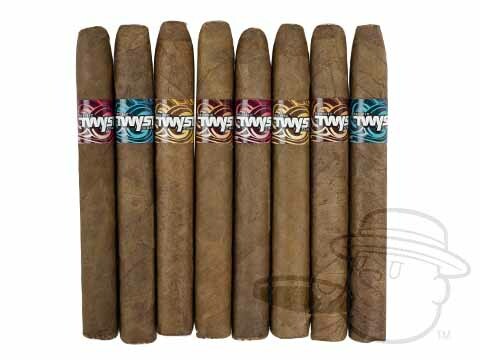 ATTENTION: Pacific Twyst is not your average flavored cigar line. With mouth-watering flavor-infusions like the coffee and sweet Irish cream-seasoned Cafe Royale, the bold and fiery Spiced Rum, and the silky and spicy Vanilla Bourbon, it’s safe to say that you’ve never had a flavored cigar quite like Pacific Twyst. These scintillating smokes pack just the right amount of beautiful boozy infusion, and this sampler lets you try 2 cigars each of all four blends for just $2.24/stick! If one is into fused , this sampler is a must! Bought these to sample flavors I'd never buy a bundle of alone. Found some new flavored cigars I like. Good mellow infused flavors along with a nice burn and ash. Recommend these if you want to find a new flavor without committing a lot of effort. Pacific Twyst- Flavors With A Kick Sampler is rated 4.2 out of 5 based on 2 customer ratings.